Panasonic's Toughpad FZ-Y1 Performance is the first of the company's rugged range of tablets to come with Windows 10 on board, and boasts a 4K display powered by some impressively beefy components. 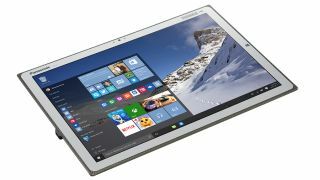 The Toughpad FZ-Y1 comes loaded with Windows 10 Pro, and offers a 20-inch IPS display (featuring a 15:10 aspect ratio) with a resolution of 3840 x 2560 for a pixel density of 230 ppi. Powering that screen you've got an Intel Core i7-5600U vPro processor running at 2.6GHz, backed up with 16GB of RAM, with an AMD FirePro M5100 graphics solution toting 2GB of video RAM (this device is designed with CAD and 3D modelling in mind). A 256GB SSD provides storage, although there is an option on doubling that up to 512GB for those that need more space, and for connectivity there's a USB 3.0 port, HDMI and LAN ports, along with a Mini DisplayPort and an SD card slot. There's also 802.11ac Wi-Fi and Bluetooth as you'd expect. Twin cameras are on board, with the rear camera being a 5 megapixel affair. Of course, being a Toughpad this is a rugged device built to take punishment, and it benefits from a strong glass fibre outer case. Despite being built with solidity in mind, Panasonic has managed to keep the thickness of this tablet down to 12.5mm, so it's not overly bulky when it comes to carrying it around. There's also an optional Electronic Touch Pen which Panasonic says gives the user a very natural handwriting experience. As you might have guessed, this large-screen tablet does not come cheap, and as Gizmag reports, Panasonic is demanding £3,180 for the privilege of ownership (it comes with a three-year warranty).